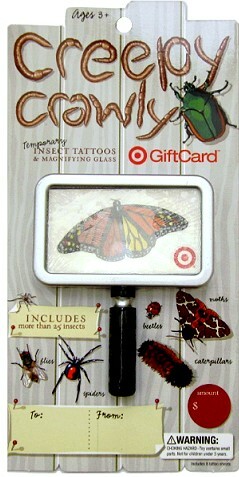 This is a great Giveaway, and I love the Creepy Crawly card! Would luv luv luv to win!! wow! this is a really fun gift card – tattoos added fun! I really could use that magnifying glass (old age is getting to my eyes!) and my son would go crazy for the bug tattoos. Of course we’d all love some Target spending money, too. I really “LIKE” totally target, and hope to win this gift card! Neat gift card, as usual! I have liked you on Facebook for a while, now. Would love to win it! Love TT too! My 2-yr is obsessed with ladybugs and as I clicked onto this post, she zoned in on the tiny ladybug so of course I have to enter. So cool! Thanks for the contest. Liked TT on my FB! Cool! Love a good giveaway! Totally Target is a great informational website…thanks !!!! Thanks for all of your giveaways! Love totally target website. I’ve been visiting 3 times a day. I LOVE target and this site because of all the money you save me there! I love Target and this site. I love that you offer these giveaways! Thanks! Love the blog!! Thanks for the opportunity!! Love this giftcard. How cool with the tattoos! A $50 Gift Card would be great … Thanks for the opportunity at a chance to win one!